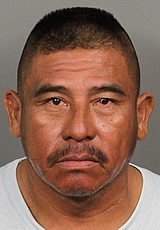 Jesus Sanchez hid in trees after DUI crash in La Quinta Calif. According to Sgt. John Gaw of the Riverside County Sheriff’s Department, on Friday, September 4, 2015, La Quinta Police officers responded to Monroe Street at Ave 58. in La Quinta, regarding a single car traffic collision. A blue 2003 Toyota was southbound on Monroe St. and collided with two power poles. Deputies contacted the driver, Jesus Sanchez, age 62 of Thermal, who was found hiding in the trees near his vehicle. The investigation revealed that alcohol was a factor in this collision. Sanchez was determined to be under the influence of an alcoholic beverage, and was arrested for misdemeanor DUI. Sanchez was transported to a local hospital for medical evaluation, as a precaution, prior to being booked at the Riverside County jail in Indio. The investigation is ongoing and anyone with information about this incident is urged to contact La Quinta Police Department at 760-863-8990, or anonymously through Crime Stoppers at 760-341-STOP (7867). Eastvale, CA – Officers from the Eastvale Police Department’s DUI Enforcement Team deployed this weekend to stop and arrest alcohol and drug-impaired drivers in the Department’s ongoing traffic safety campaign. A DUI Saturation Patrol was conducted on Thursday, September 3, 2015, between the hours of 4:00 p.m. to 10:00 p.m. in areas with high frequencies of DUI collisions and/or arrests. After falling dramatically for five straight years, figures for 2012 show an increase to 802 deaths because someone failed to designate a sober driver. Over the course of the past three years in the City of Eastvale, DUI collisions have claimed approximately 4 lives and resulted in 210 injury crashes harming 230 of our friends and neighbors. If you’re drinking and driving, law enforcement will find and arrest you. No warnings, no excuses. The only way to truly avoid a DUI is to drive sober. There are many ways to get home safely after drinking, and driving isn’t one of them. Designate a sober driver ahead of time, or call a friend or family member. You could also use public transportation or call a taxi. The cost of cab fare is nothing compared to a $10,000 DUI or the cost of someone’s life, and the ‘inconvenience’ of not driving your own car home is nothing compared to the inconvenience of spending time behind bars. This entry was posted in DWI arrest photos, DWI Arrests by State, Hit and run DUI DWI drivers and tagged Eastvale Police Department's DUI Enforcement Team, Jesus Sanchez DUI crash and hid in trees, La Quinta Police Department, Riverside County jail in Indio, Sgt. John Gaw of the Riverside County Sheriff's Department. Bookmark the permalink.